Audience members give an applause to the end of a film being screened at the Buried Alive Film Fest. If you like to celebrate Halloween year-round, you won’t have to go farther than Little Five Points to get your next horror fix. With plenty of fake blood at the ready, Buried Alive Film Festival will keep you on the edge of your seat with five days of spooky shorts and creepy features. Buried Alive also has some one-of-a-kind surprises lined up for this year, including a presentation from a Satanist. “Sunday at noon we’re having a film called, ‘Sympathy of the Devil: The True Story of the Process Church of the Final Judgement,’ which is a documentary about a Satanic cult and so the film is being presented by Fred from the Satanic Temple,” Myers said. The documentary explains and debunks the conspiracy theories surrounding The Process Church of the Final Judgement, a cult that has been accused of influencing the killing of Bobby Kennedy and inspiring Charles Manson and Son of Sam, earning the group the title of “most dangerous cult in America,” according to Buried Alive’s website. The festival will also be showing the 40-year anniversary, remastered version of Brian De Palma’s “Carrie,” complete with 1970s-style prom photoshoot and all. Fest goers can even come get their picture taken with Carrie. There will also be a zombie photoshoot for the Zombie Extravaganza. Buried Alive is offering more than films. They’ve dipped into live entertainment, thanks to Blast Off Burlesque. If the sight of blood doesn’t make you queasy, there will be plenty of popcorn to snack on from the Box Office. 7 Stages is also connected to Java Lords, a coffee shop and full bar so you can grab a drink and enjoy the festival. Festival winners will be decided by a panel of three judges and announced at the end of the festival. The festival also has special awards for the best local films, according to Myers. You’ve probably heard of 48-hour film festivals, but Buried Alive is giving local filmmakers a bit of a break with their very own spooky escapade. 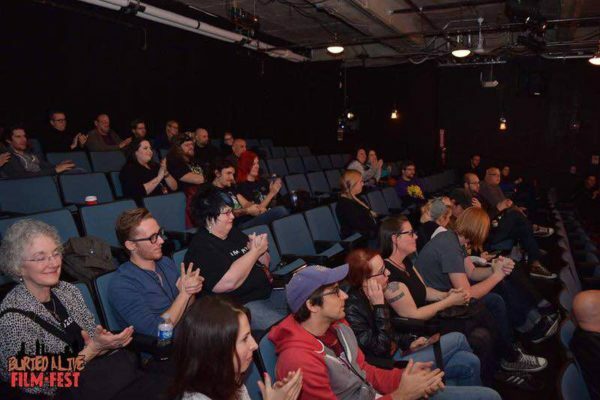 The Sinema Challenge was designed to inspire local filmmakers to create breathtaking and terrifying horror films without the major time constraints. The teams participating have 13 days (a number Myers said they chose because it’s “spooky”) to create a horror masterpiece in a specific genre. Myers explained how the selection process worked. The teams began filming on Nov. 1 and wrapped post-production on Nov. 14. Judges will be screening the movies and selecting winners, which will be announced at the public screenings on Nov. 16. Parking is available behind in the lot behind 7 Stages for a fee of $2-$7 for a full day depending on the day of the week. Nov. 16: 8 – 9:30 p.m.
Nov. 17: 7 – 10:45 p.m.
Nov. 18: 6 p.m. – 2 a.m.
Nov. 19: Noon – 11:45 p.m.
Nov. 20: Noon – 9:45 p.m.
A full schedule breakdown can be found at buriedalivefilmfest.com/schedule/. Tickets are $12 per screening block or $10 with a valid student ID. The Festival is rated 17+, so no one under 17 will be allowed in without a parent or guardian.